It was standing room only for ANC 6B’s August 4 community meeting on the status of the Barney Circle-Southeast Boulevard Project Planning Study. Dan Emerine of the Office of Planning presented four of seven concept alternatives that show how the project could benefit the neighborhood and city. In November 2013, the District Department of Transportation shared five design concepts for replacing the end of the Southeast Freeway with a boulevard and constructing a full traffic circle at Barney Circle SE. As I detailed at the time, all five DDOT concepts essentially replaced the freeway with….a freeway completely separated from the neighborhood grid. ANC 6B unanimously opposed DDOT’s concepts and urged the agency to reconsider their plans. Attendees listen to the Office of Planning’s presentation at the Aug. 4 Barney Circle-SE Blvd. meeting. At the request of Ward 6 Councilmember Tommy Wells, the Office of Planning has been conducting a “rapid planning study” to take a holistic look at the project area and to suggest ways that the project could enhance the neighborhood. Both ANC 6B and DDOT have been involved in the OP study, which will wrap up sometime this fall. During the August 4 meeting, Emerine walked attendees through four of the seven preliminary concept alternatives produced for the study by SmithGroupJJR. Concept A1 includes a medium level of development between L Street and the proposed boulevard, a high degree of connectivity to the neighborhood grid, 4 lanes for the boulevard and bike lanes and sidewalks. There would be a pedestrian connection over the CSX railroad tracks and the potential for mixed-use development along 14th Street SE. Concept A1 – Avenue. All concept images from Office of Planning and SmithGroupJJR. 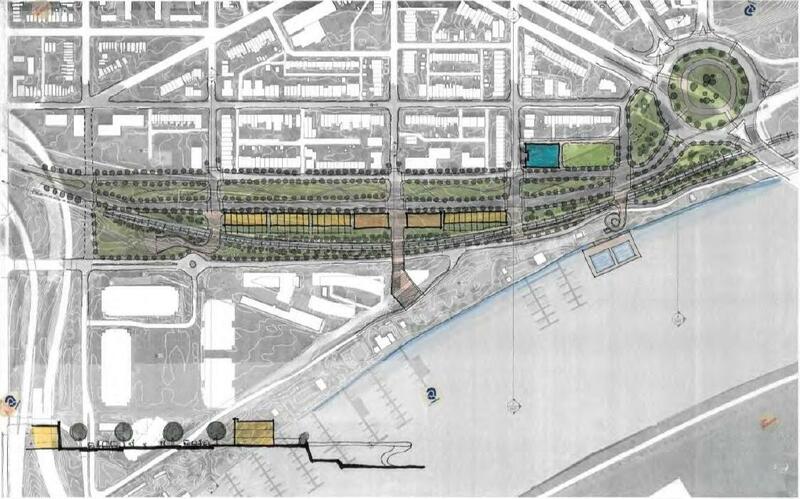 Concept B1 includes an approximately 80 foot wide linear park between L Street and the proposed boulevard. Both L Street and the boulevard would serve as two lane one way arterials (L Street would be 2 lanes westbound and the boulevard would be 2 lanes eastbound). 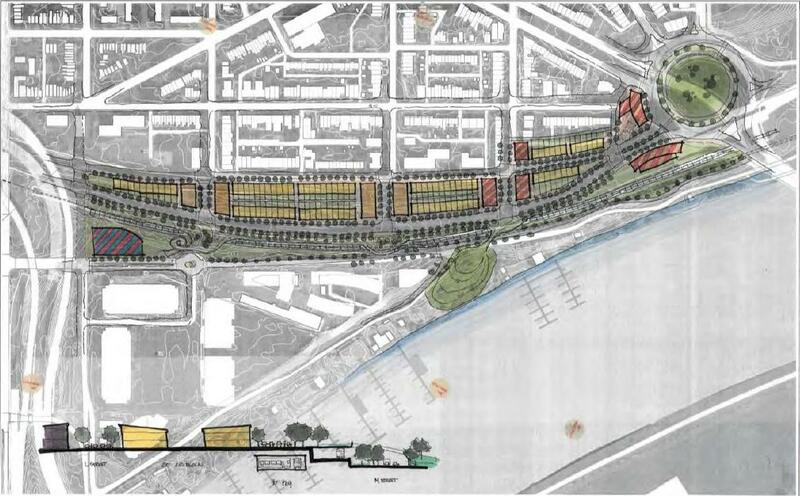 There would be some low intensity development below L Street and the potential for bike lanes and pedestrian connections across the CSX tracks at 13th, 14th, 15th and 16th Streets. Concept B1 – Split Linear Park. Concept C2 includes no new development. Instead, a linear park would be constructed south of L Street with pedestrian crossings above the four-lane boulevard. There would also be no connections between the existing street grid and boulevard. Concept C2 – Linear Park. Emerine also shared Concept A2 which extends the grid to two-lane boulevard, with low intensity (rowhouse) development between L Street and the boulevard. 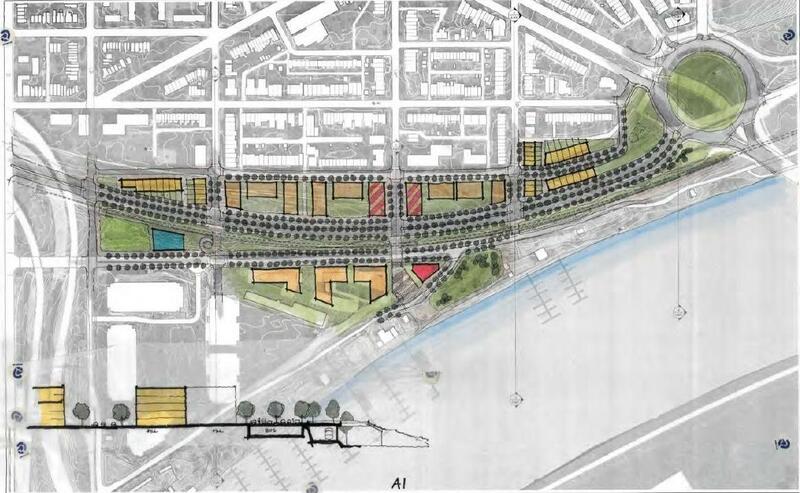 This concept envisions 15th Street SE as a potential pedestrian connection to the waterfront with the potential for mixed use development. Concept A2 – Grid Extended. For more details, check out OP’s PowerPoint presentation (pdf) and larger versions of the concept alternatives (pdf). Attendees agreed that the concept alternatives were significant improvements over the five concepts DDOT presented in November 2013. The consensus in the room seemed to be in favor of a two-lane versus a four-lane boulevard. The question is whether DDOT will agree to consider concepts with a two-lane boulevard. Any option that involves converting L Street into the boulevard (or a part of the boulevard) is problematic. It would certainly change the nature of a primarily residential street. I remain a strong advocate for extending the grid and connecting 13th, 14th and 15th to the boulevard. Without connections, the new boulevard will essentially be a freeway and will attract additional traffic through the neighborhood. 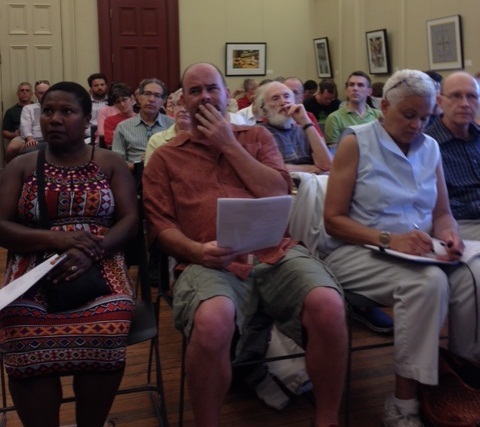 The audience had mixed view on the whether there should be new development between L Street and the boulevard. I think development would reinforce the extension of the neighborhood grid and provide additional housing and retail potential. The level/intensity of development could be determined in a subsequent small area planning process. Everybody loves the idea of more green space, but we really need to think about how the green space can be used. What types of activities or features will draw people to this space? A mix of development and green space could be a good combination. On Barney Circle, attendees encourage OP to consider designs that would make the circle more pedestrian and bike friendly. And I love the idea of a fountain or monument at Barney Circle – something that would encourage people to check out/hang out in the circle (like Dupont). Interestingly, the new Barney Circle would be the second largest traffic circle in the city (behind the Lincoln Memorial Circle). Most of the concept alternatives could accommodate an underground bus parking garage with access only at 11th Street and Barney Circle. However, the overwhelming majority of the community remains opposed to such a facility. OP plans to incorporate community feedback into their study. The goal is to recommend three well-developed concepts that can presented to the community and delivered to DDOT in September/October. DDOT can then use the concepts to refine their work on the transportation planning side, hopefully leading to a better project outcome. Now for the bad news. Bowing to political pressure from both DC and Maryland commuters, DDOT is planning to temporarily re-open the freeway between 11th Street and Barney Circle by the end of the year. Construction crews are already putting the old road back in place using funding from the 11th Street Bridge Project. This is a really, really bad idea. In addition to being a huge waste of taxpayer dollars, re-opening the road will encourage more vehicles to cut through Hill East on 17th and 19th Streets, exacerbating traffic issues. And once the freeway is re-opened, the city may decide to keep it open permanently, resulting in a lost opportunity to connect the neighborhood to the waterfront. 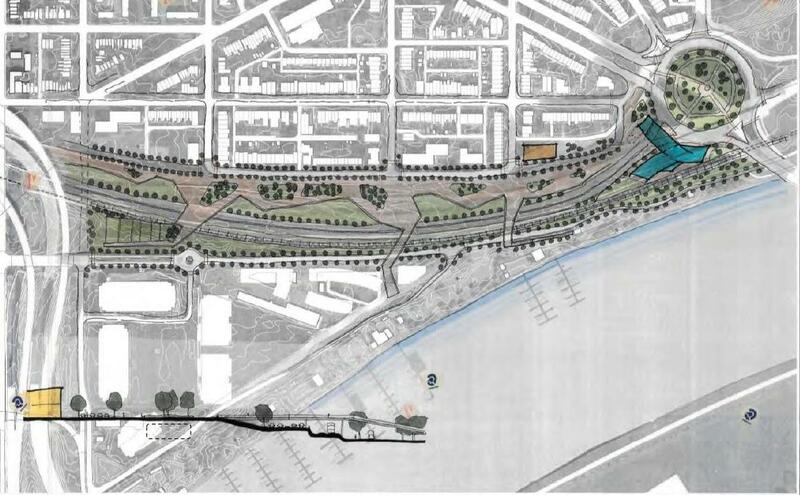 ANC 6B will consider a motion to oppose the temporary re-opening of the freeway in September. What do you think about the concept alternatives? Please post your comments and feedback below. On Monday, August 4, ANC 6B will host a community meeting to discuss the status and outcomes of the Barney Circle-Southeast Boulevard Planning Study being conducted by the Office of Planning. The meeting, which begins at 7 pm, will take place in Sousa Hall on the 2nd Floor of the Hill Center (921 Pennsylvania Avenue SE). At the request of Ward 6 Councilmember Tommy Wells and ANC 6B, OP has been conducting a “rapid planning study,” with the goal of improving the District Department of Transportation’s initial design options for the Barney Circle-Southeast Boulevard project. During the Aug. 4 meeting, OP representatives will provide a brief presentation on the study, share some of the outcomes and answer commission and community questions. If you are interested in the study but unable to attend the meeting, I do plan to post a brief summary of the meeting highlights. Councilmember Wells, OP, DDOT and ANC 6B also plan to have another community. meeting in the fall to share the study’s final recommendations. As Metropolitan Police Department and FBI continue their search for missing 8-year old Relisha Rudd and her apparent abductor, you can help the other homeless children at DC General by supporting The Homeless Children’s Playtime Project. Relisha is one of the many children living at DC General that benefit from the activities of the Playtime Project, a wonderful nonprofit organization that works to brighten the lives of homeless kids. Consider a donation or purchase a gift off their Amazon wishlist. Next Tuesday, April 1 is primary day in the District of Columbia. If you have a party affiliation, make sure you get out and vote either on April 1 or today and tomorrow at one of the 13 early voting centers. Polls will be open from 7 am to 8 pm on April 1. I’m supporting Tommy Wells for Mayor and Charles Allen for Ward 6 Councilmember in the Democratic primary. The owners of New York Pizza, located at 1401 Pennsylvania Avenue SE, plan to expand their business into the vacant commercial space across the street at 1400 Pennsylvania Avenue SE. To do so, they will need a “fast food” special exception from the Board of Zoning Adjustment. ANC 6B will likely consider the special exception request in May. On Monday, March 31, ANC 6B’s Transportation Committee will discuss the DC Office of Planning’s rapid response planning effort on DDOT’s Barney Circle-Southeast Boulevard Project. The goal of the 3-4 month effort is to take a holistic view of potential uses within and surrounding the proposed Southeast Boulevard right of way. The meeting is from 6:30 pm – 8:30 pm at the Hill Center (921 Pennsylvania Ave SE). Speaking of DDOT, I have some good news to share on the delayed 17th & 19th Streets Safety Improvement Project. According to the agency, construction on both streets will take place this year beginning with 19th Street in May. DDOT expects construction on the 17th Street portion of the project to begin in September. During its Jan. 14 meeting, Advisory Neighborhood Commission 6B voted unanimously (10-0) to send a letter (pdf) to the District Department of Transportation (DDOT) expressing the commission’s opposition to the agency’s proposed design concepts for the Barney Circle-Southeast Boulevard Transportation Planning Study. DDOT is currently seeking public comments on the study, which envisions the construction of a full traffic circle at Barney Circle SE and a new “Southeast Boulevard” to connect the circle to the Southeast/Southwest Freeway at 11th Street SE. A big thanks to all who submitted comments and feedback to ANC 6B or copied me and other commissioners on comments sent directly to DDOT. I’m particularly appreciative of the comments I received on the Barney Circle options from residents living on 16th, 17th, Kentucky Ave and H Streets SE. Hopefully, DDOT will listen to our concerns and reconsider their design concepts. Also, thanks to Commissioner Kirsten Oldenburg (6B04), ANC 6B’s Transportation Committee Chair, who assembled the comments and drafted the bulk of the letter. If you have not already done so, I encourage you to e-mail your comments and feedback directly to DDOT at barneycircle@prrbiz.com. The committee recommended a number of clarifying changes to the comments including the addition of an opening sentence that conveys the commission’s opposition to the design concepts presented to the community on Nov. 21, 2013. The committee also wanted to make it clear that other stakeholders besides DDOT need to be brought into the project discussion. ANC 6B will vote on the revised comments during next Tuesday’s (Jan. 14) full commission meeting (7 pm at the Hill Center). Please post your feedback on the draft comments below. You can also share your thoughts with me during my office hours this Sunday, Jan. 12, 2 pm – 3 pm at Curbside Cafe (257 15th Street SE). On Wed., Jan. 8, ANC 6B’s Transportation Committee will be discussing the commission’s formal comments to the District Department of Transportation on the proposed design concepts for the Barney Circle-Southeast Boulevard project from 6:30 – 8:00 pm at the Hill Center (921 Pennsylvania Avenue SE). If you have not yet had a chance to weigh in on this important project, please attend the committee meeting or send your comments directly to DDOT at barneycircle@prrbiz.com. Thanks to all who have already attended meetings and/or sent comments. Construction on the two-story commercial building at 1442 Pennsylvania Avenue SE is almost complete. Douglas Development plans to finish the building this month. Still no word on potential tenants, though Douglas hopes to have some news to share soon. Goldstar Group is seeking a parking variance for their proposed 41-unit residential building at 1500 Pennsylvania Avenue SE. Goldstar plans to provide the required parking for the building (21 spaces) but needs to include 8 compact spaces. Under the current DC zoning code, compact spaces can only be counted in garages that have more than 25 parking spaces. The Board of Zoning Adjustment will consider Goldstar’s variance request at a hearing on Feb. 25. ANC 6B will consider the variance request during our February meetings – the Feb. 3 ANC 6B Planning & Zoning Committee meeting and the Feb. 10 full commission meeting. I’ll share more information later this month. NOVO Development group plans to begin construction on 1600 Pennsylvania Avenue SE sometime in February. I’m working to schedule a community meeting to discuss construction, etc. with nearby neighbors. This week, the National Symphony Orchestra will be holding a series of free concerts around Capitol Hill and H Street NE, including a chamber music concert on Sunday, Jan. 12, 12 pm – 1 pm at the Congressional Cemetery Chapel (1801 E Street SE). The events are part of the “NSO in Your Neighborhood Program” which runs from Jan. 7-13. You can learn more about the program and view a full schedule on the NSO website. After attending the concert, stop by my office hours on Sunday, Jan. 12 from 2 pm – 3 pm at Curbside Cafe (257 15th Street SE). No formal agenda – just an opportunity for you to share feedback, questions and concerns with me.